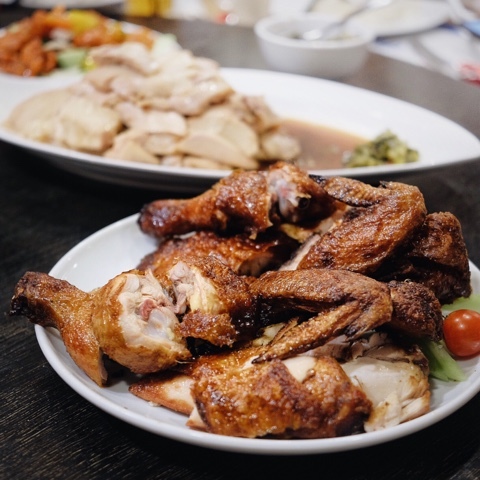 Good news for you chicken rice lover: Boon Tong Kee is opened at Pantai Indah Kapuk! 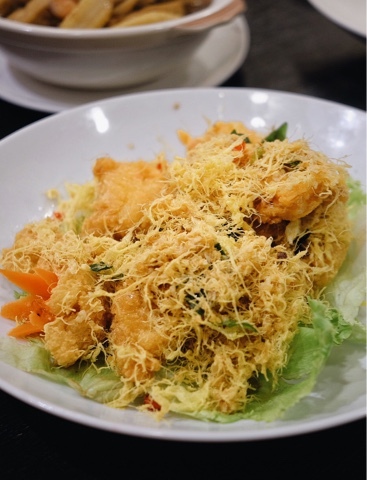 Yes, that famous Boon Tong Kee from Singapore is finally serving their well-known recipe to us. So excited to try this one, let's see how good it is! 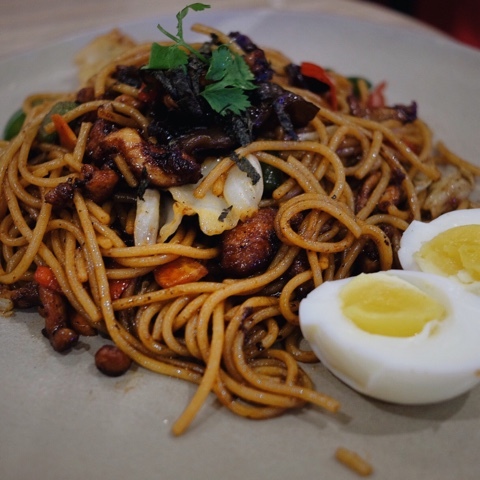 Place was nice, located in the row of Legend of Noodle/Native Coffee shop near Pantai Indah Kapuk hospital. 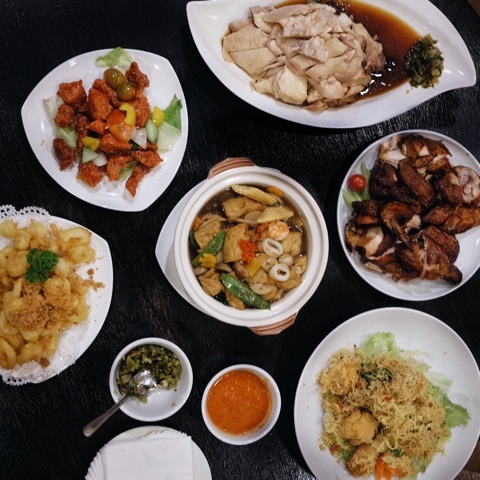 It was suitable for family dinner, and I tried it with my #JKTfoodies family. I did not take any picture of the hainan rice, but they shaped it into pyramid on the plate. It was soo soo fragrant yet I could imagine the goodness of the taste. It was rich and tasty, too bad the portion was quite small. I put high expectation on this. I found it quite dry and did not juicy. Taste was okay, seasoned just fine. Skin was crispy enough, but still, I was hoping better than this. But the portion was generous and perfect for sharing! I preferred the boiled chicken, because it was juicier than the roasted one. It was tender, seasoned well, and big in portion. I recommend you guys to try this one! Heart warming bowl. Everything on the plate was tasty, perfect for your rainy season. Too bad they were using Chinese tofu instead of Japanese tofu, because I found it rare to use Chinese tofu and somehow I did not like the consistency of it. The Japanese one would give smooth silky tofu and better taste, I guess. 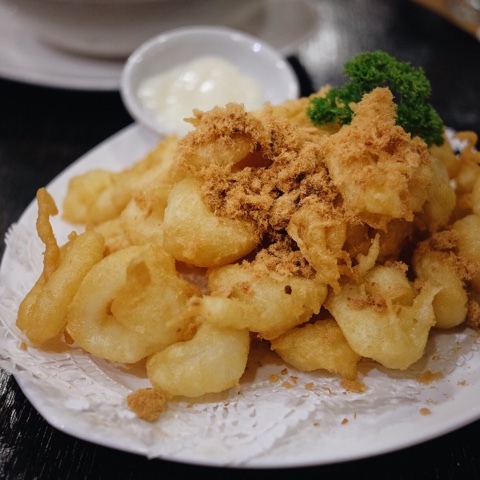 Crunchy squid, well seasoned. It was just okay. Served with mayonnaise, it could one of those comfort foods everyone gonna love, right? Pork was tender, crunchy on the skin. They supposed to be sweet and sour, but I did not find any sour taste on it. It felt like they were using honey for the sauce, and it was kinda too sweet, even for me. Did not see this coming, but this one was one of my favorite here! 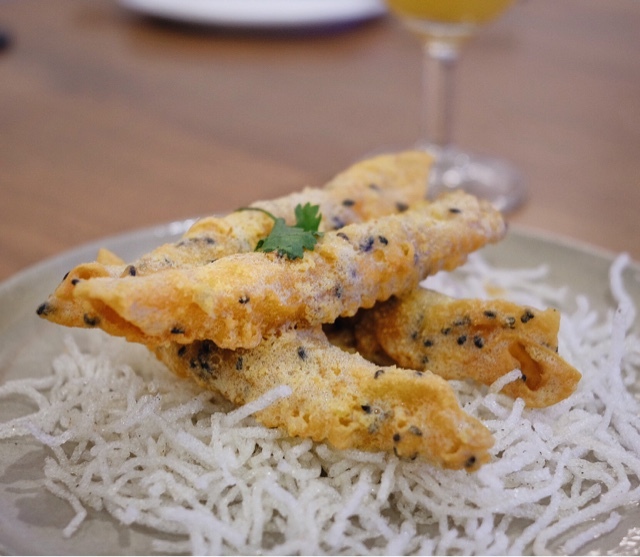 Generous cuts of crunchy dory fish, well seasoned cereal, very enjoyable! Overall it was quite okay. The highlighted one was the hainan rice itself. The other dishes was just okay. Portion-wise, the chinese restaurant was suitable for sharing. Good luck for your opening! CHIR-CHIR is now serving in Indonesia! 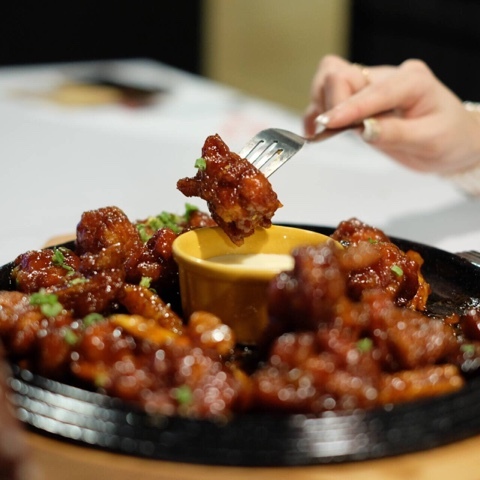 Korean Fried Chicken is something big in Korean itself, and some countries such as Singapore. 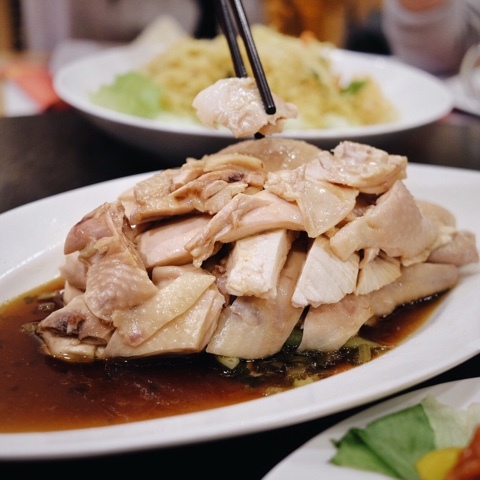 I've heard that Chir-Chir is quite a big hit in Singapore. 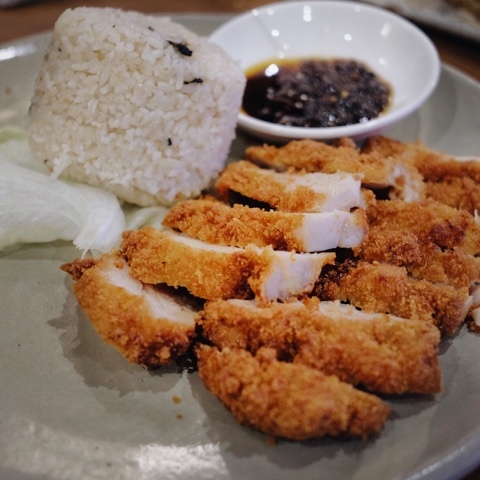 I've read some reviews about Chir-Chir in Singapore and drooling at some of their menus. They got good reviews for it too! So let's see how good it is in Jakarta! All of their portion is big, even the appetizer! Fries is nice, melted cheese is quite generous and yummy. The fries is served with some kind of creamy sauce which is quite good. 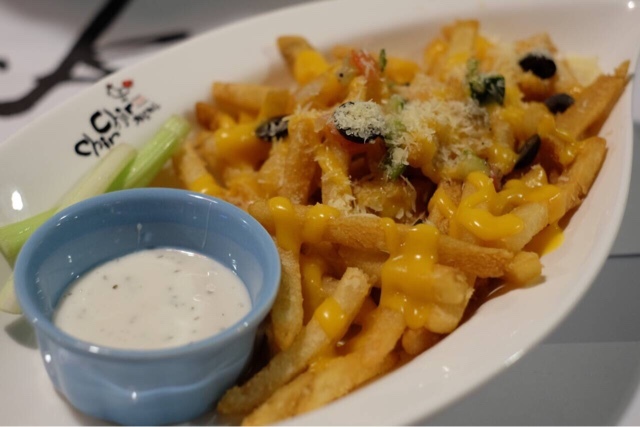 Well, cheese and fries is a combination people can not resist, right? This one is really good! Boneless chicken cooked with sweet and spicy sauce which is very flavorful, served with tteobokki and sweet potato. Not to mention the cheesy mayonnaise sauce which is also good! Well my opinion might be subjective because I personally LOVE the sweet and spicy sauce. Some of my friends said it was too sweet for them, but still, I enjoy this one A LOT! A unique innovation of theirs! Boneless chicken served with lotsa spring onion and garlic of the hot pan. 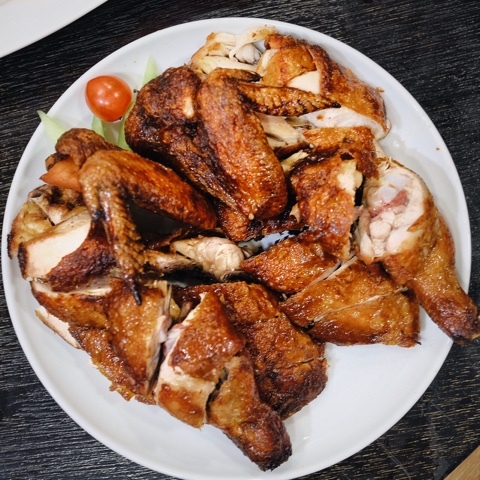 Chicken is juicy and quite thick. I personally do not eat the spring onion, but the garlic is really boosting the flavor. It is good, but I prefer not to have the boneless one. This one is also my favorite! 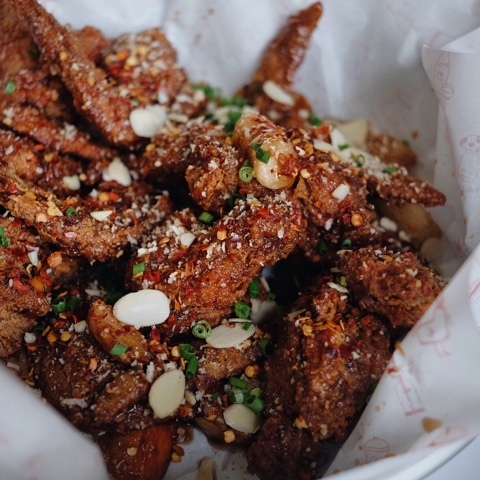 Finger licking good fried chicken, very flavorful, and topped with lotsa garlic on it. Chicken is crunchy and well seasoned. 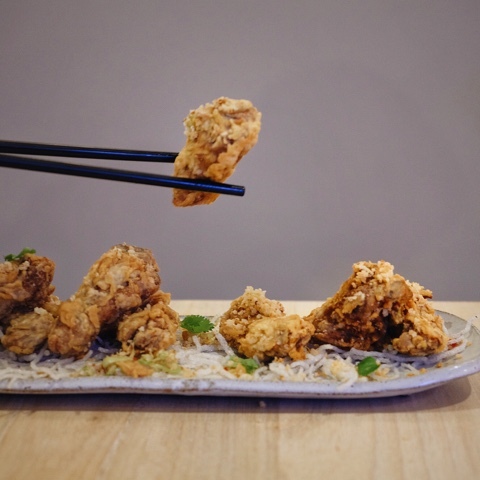 This kind of fried chicken is something that everyone gonna love. I will recommend this to people if they are asking what to try in Chir-Chir! Overall I really have a good time a Chir-Chir Indonesia. 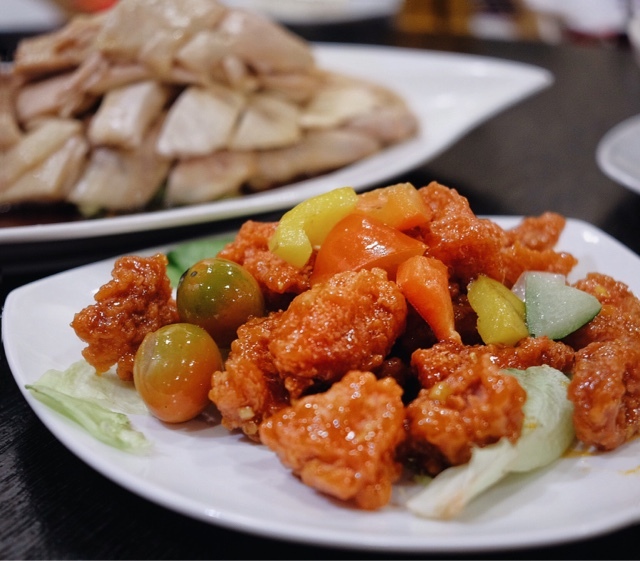 Tasty food with big portion that are meant to be shared with good friends. Gonna come back for sure! PS: some of the photos are taken from The Hungry Doctor. Thanks! I really like it when a restaurant is being innovative to market their product. 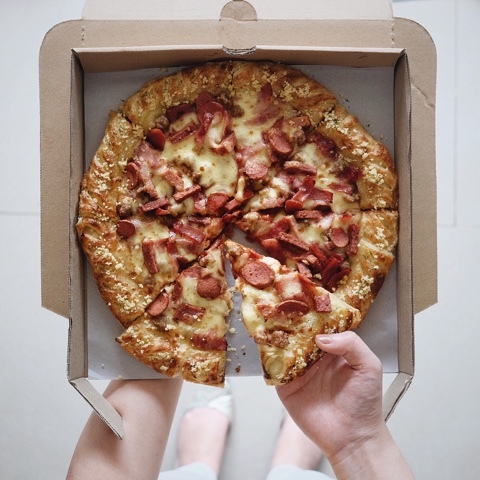 I know Pizza Hut Delivery (PHD) is one of them who keep up the innovation and creation alive. So I am more excited to try this one! 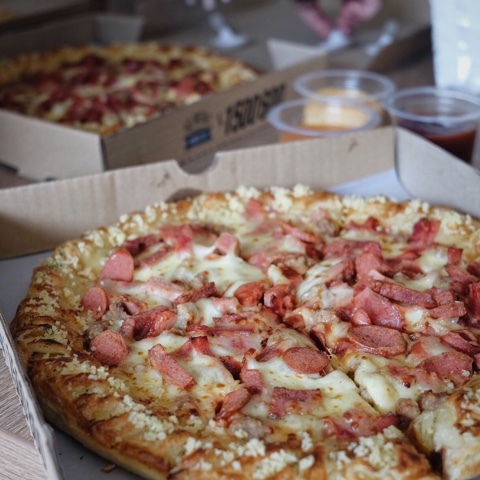 Thing about PHD itself, they are the first thing pop up in my mind when it come to order pizza at home or during the night shift at hospital. 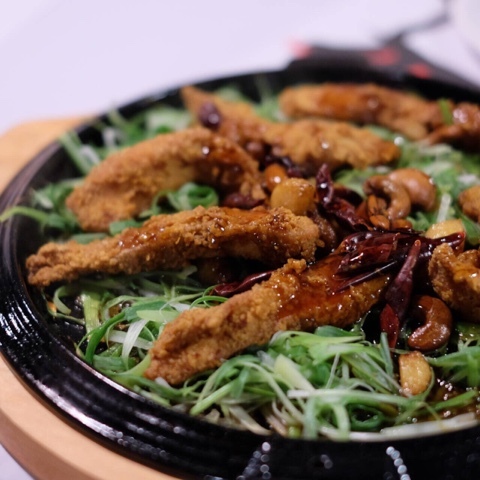 The taste is undoubtedly satisfying with wide selections of menu. One of the most important thing is, they are coming on time. 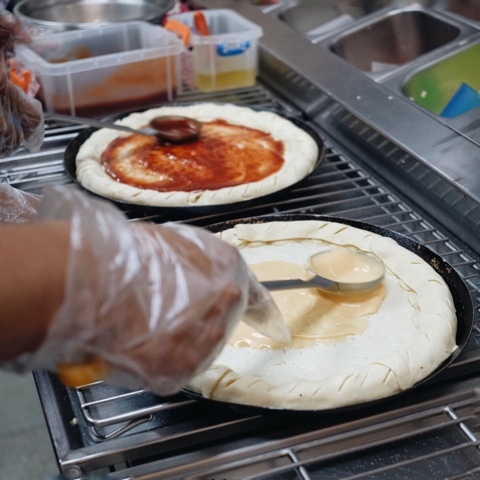 Yes the sauce is for the base of the pizza! The sauce is not sold separately. Wondering how good they taste. I love the cheesy mayonnaise sauce! 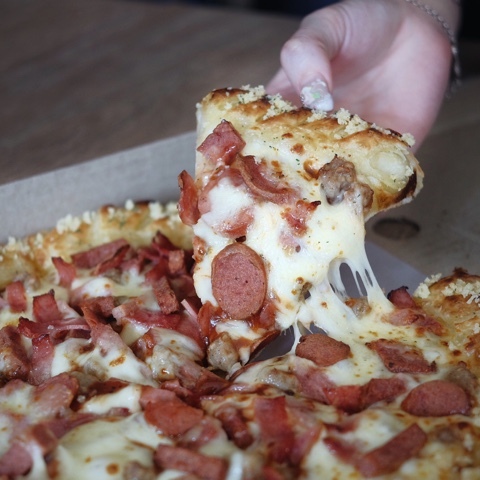 The cheese is quite dominating. It's definitely my favorite because they just really mix well with all the toppings of the pizza. 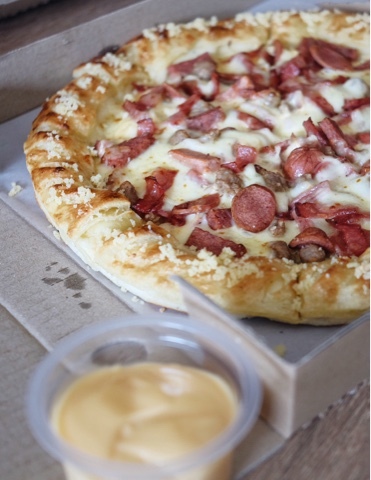 Well, who can resist twist of cheese and mayonnaise? Spicy tomato sauce can be your choice if you're a big fan of tomato sauce. The sour taste is quite strong with a hint of spicy aftertaste. 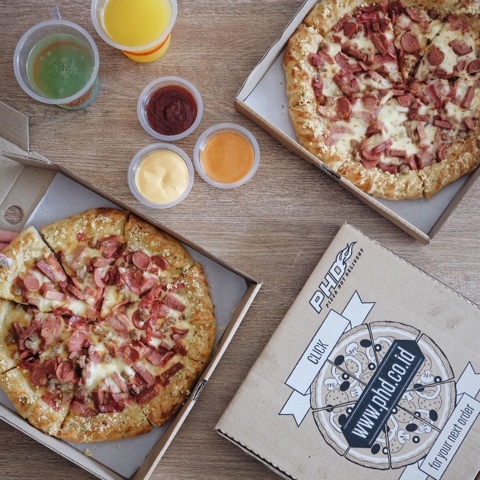 Honey BBQ is somehow kind of sweet kind of sauce with fragrant BBQ for your pizza. This can be your favorite if you are fond of sweet sauce. 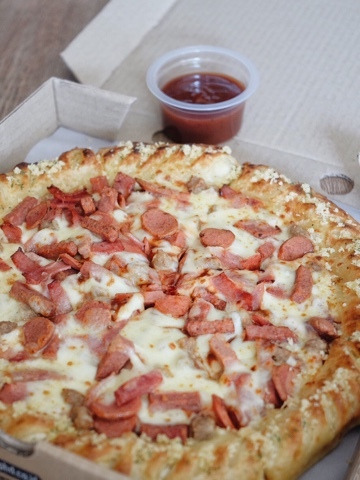 Apart from the new sauces, they also release new crust which is sausage pastry crust. 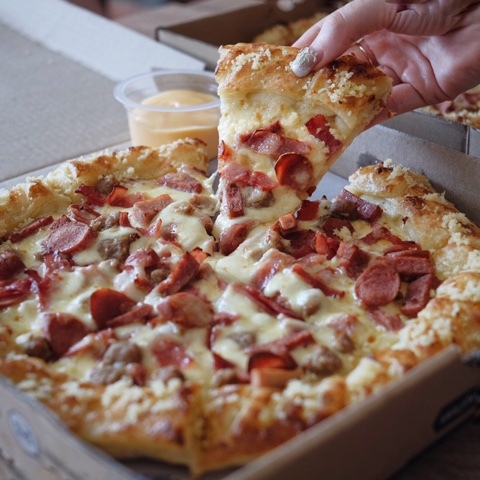 Imagine you're having this flavorful sausage at the end of your pizza bite! More over they are wrapped with puff pastry and parmesan cheese on the top of it. I personally love it! The buttery taste on the pastry is real good! I am such a big fan of pastry crust! And the permesan cheese? MAJOR LOVE! 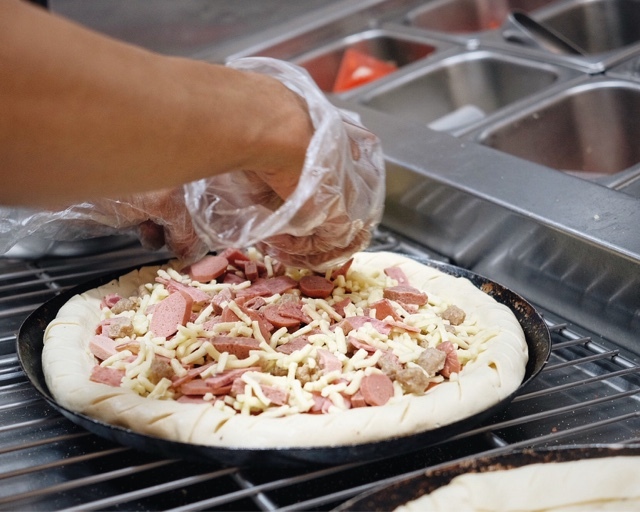 And the good news is, you can have this sausage pastry crust for all pizza topping, in regular or jumbo sauce. Yeay to us! The party I had earlier with my friends. Such a great time with friends with PHD! PS: you can order it via phone/website. Overall I do loooove this new menu. 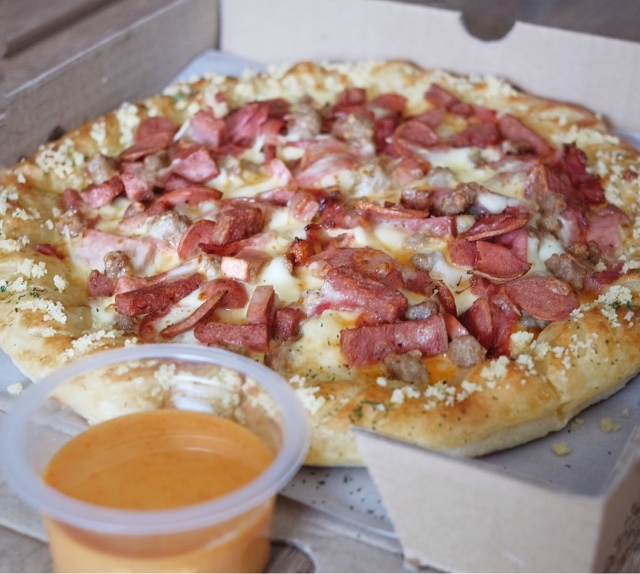 Order it, just wait for 30 minutes, and you're ready to have it! I'm Nomz is one of the well-known restaurant in Grand Indonesia, which I like because of their never ending innovation. Recently they launched some new products called salted egg yolk croissant, peanut butter and jelly croissant, and ovo momo croissant. 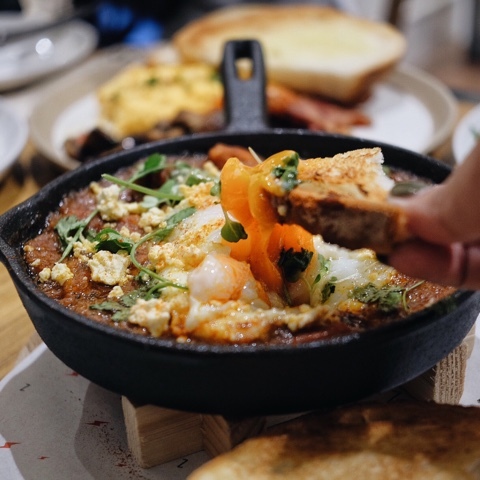 While the croissant is still being the talk of the town, they launched this new brunch menu. I am a major fan for brunch menu, so this one excites me much!!! For now their brunch menu is available only on Saturday, at 10 am to 2 pm. Make sure to visit them on your weekend! A good classic one. A portion of grilled tomato, chinese sausage (sure I chose this over th chicken sausage! ), waffles, and sunny side ups. I have to say, the egg is perfectly fine. Waffles is fluffy, with crispy skin on the outside. The chinese sausage is surely the winner of the plate! Surely I haven't seen any breakfast set with this before, they usually had bacon in it,but this one really is an extra ordinary one! This one is the bomb! 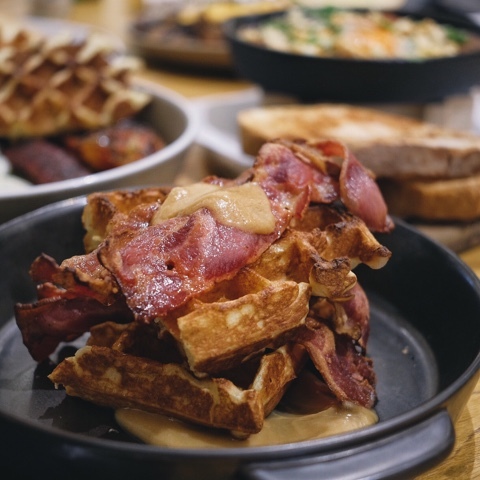 Thick fluffy waffle topped with crispy bacon, and you know what, they are using peanut butter sauce with maple syrup on it! Peanut butter itself had won my heart easily, and the smell of maple added the beauty in it. I just could not stop munching it! MAJOR LOVE! 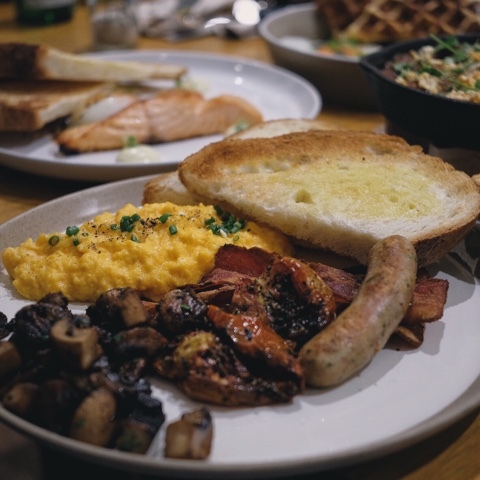 Plate of big breakfast. Everything on the plate was surely pleasing me. 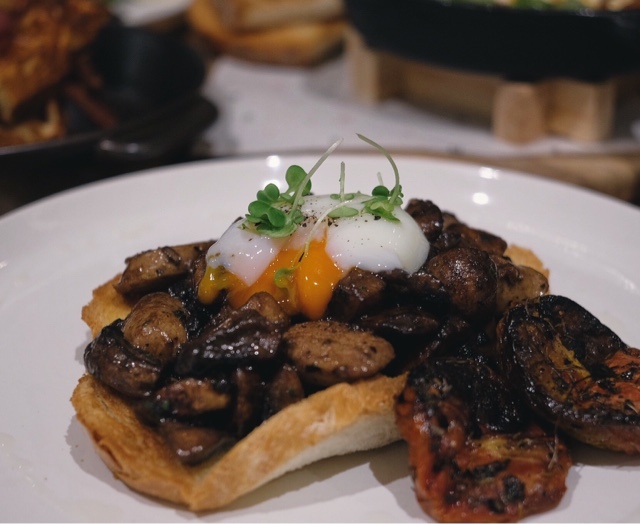 Scrambled egg was fluffy, mushroom was really juicy, tasty sausage and grilled potato, with crunch toasted bread. Portion wise was quite generous, had right amount in it. Happy tummy indeed! This one actually tasted quite similar with the big breakfast, but in a constructed one. I loved how pretty the perfect onsen egg on the top, juicy mushroom, well seasoned sausage. 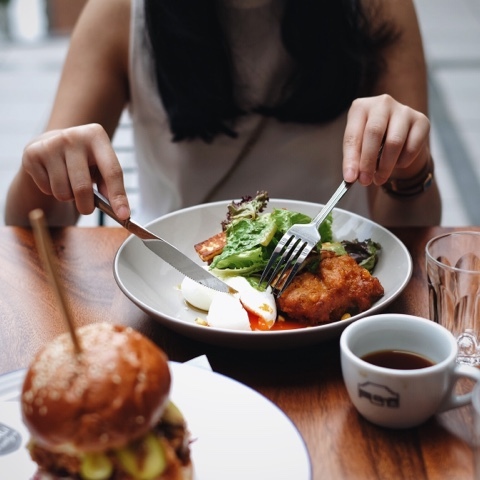 Pretty meal is surely one of the perks of having brunch! For you guys who wants a healthier option, this one can do! Grilled salmon with poached egg (which was perfect as usual), avocado, pesto, and lemon, and toasted bread on the side. Tasty is now being a real best friend with healthy! One way to describe it : rich and flavorful. Poached egg, paprika butter, salsa verde, and bread. The consistency was quite thick, but not in a bad way, something in a good way. Dipping the toasted bread in it is surely the best way to have it. The crunch, the tomato sauce, the creamy egg, very flavorful indeed! Okay this one really excites me a lot. I am a real big fan of pastry, and peanut butter, strawberry jam! Peanut butter and jelly is surely one of the top list on my breakfast. And having this one, did not need much effort to please me. 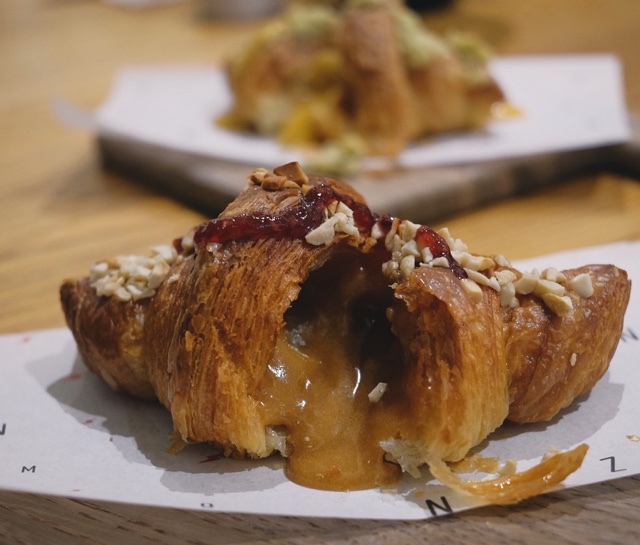 Flaky and crispy croissant, with burst of peanut butter inside and strawberry sauce on top. Oh i wish they add more strawberry jam to enhance their flavor, but this one was real good! One real winner. 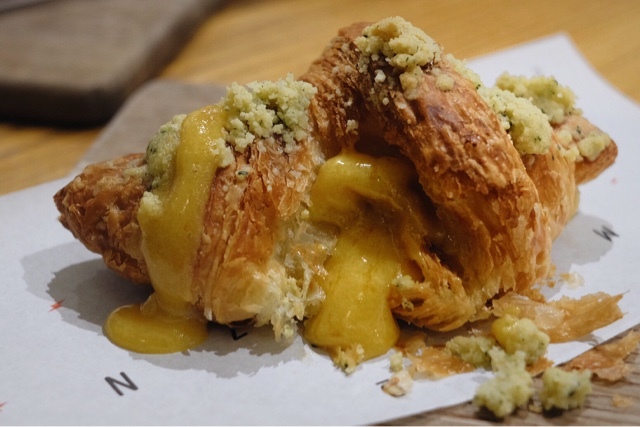 Tasty and rich salted egg sauce on the side, crispy outer of the croissant, buttery crumble on the top. Everything was just fine! Overall their brunch menu is very enjoyable. Tasty, generous, and beautiful. 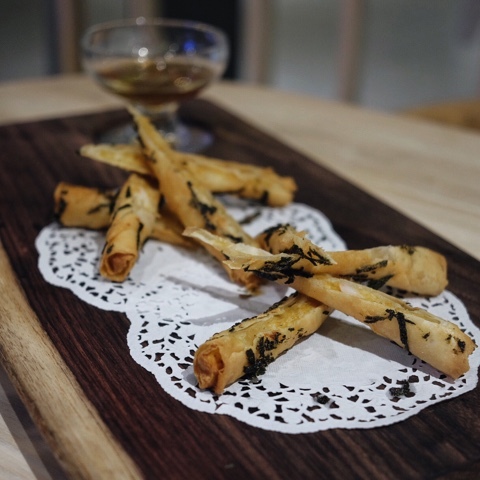 Make sure to try this new menu at Nomz Jakarta! MYou have heard about Ming Village. It is one of my choice when I decided to have Chinese food in mal. Recently ,they came up with an idea to have place which was more suitable with young lifestyle, so Little Ming was born. 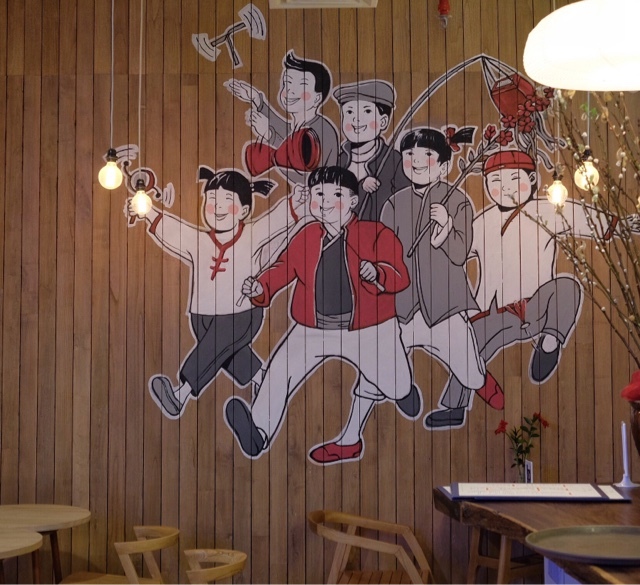 It was located right next to Ming Village, with minimalist and more fun ambiance. The place was quite big, with capacity of 70 people. Ambiance was nice and kinda dark, suitable for the atmosphere of dimsum bar. 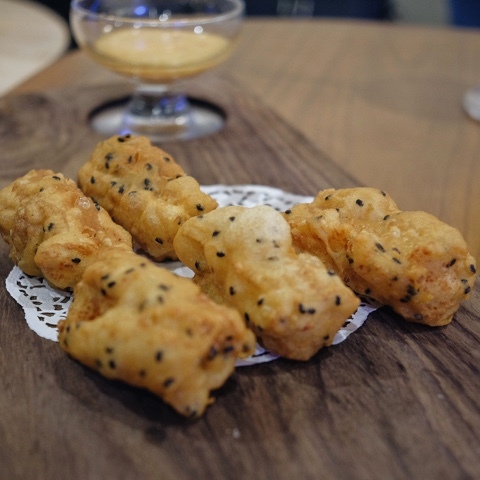 Crunchy deep fried cakwe with prawn filling. Spring roll with prawn filling and nori. My favorite appetizer! Basically it was fish spring roll with served with salted egg sauce. Salted wgg sauce was palatable with well-seasoned and crunchy rolls. I can have it all for sure! It was the champion of the night! Perfectly cooked fried noodles topped with fried egg. The noodle was kind of my favorite, with a hint of black pepper sauce to make it great. 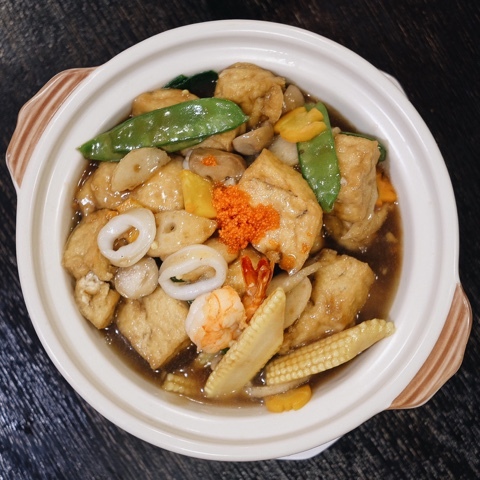 It was surely my dfavorite finition of comfort food, and I think I would have it wherever I visit Little Ming. 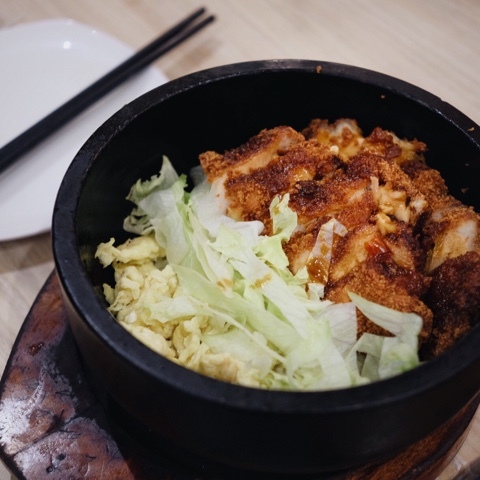 A hot bowl consisted of house special rice with deep fried chicken. I found the rice was too ordinary, because they used the usual steamed rice. But it was okay because the chicken katsu was greeaat! It was very tender and well seasoned, together with egg and veggies. It was everyone favorite! Chicken wings topped with salt and pepper flakes. Easily won everybody's heart. So basically I had quite a good time. It was something new to have a fusion of Japanese and Chinese restaurant in the mal like Little Ming. Taste was fine and price was enjoyable, moreover it was supported by good ambiance, a perfect place to enjoy a good vibe with friends. Haven't try it yet? Go try it real soon! It's a loong time ago since my last post (I know, forgive me!) but I was having my biggest and last exam to be a general practitioner, so wish me luck! Result gonna be out in a month *crossing finger! So here comes St. Ali! 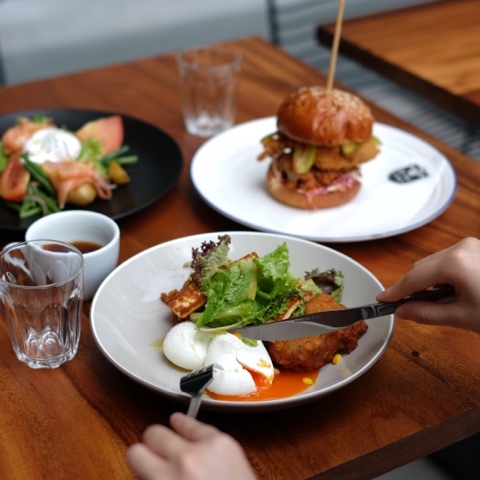 One of the newest brunch place from Melbourne, opened its door in Setiabudi One building! 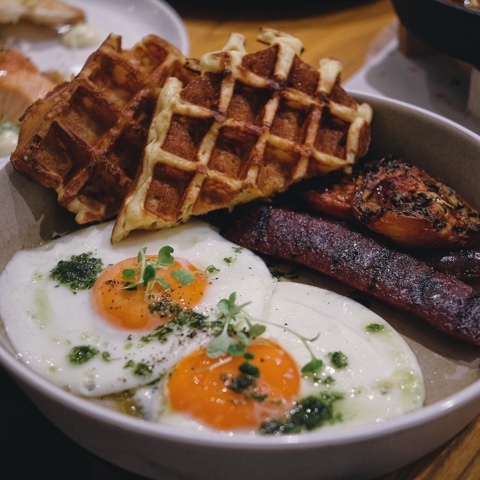 Located in the heart of Kuningan, easily reached, surely it was a good place to have brunch in Australian way. Open air with breeze accompanied my brunch that day. It was quite a pack morning, I guess because they just opened in 2 weeks. Most people tried to discover something new! Latte art by St. Ali. 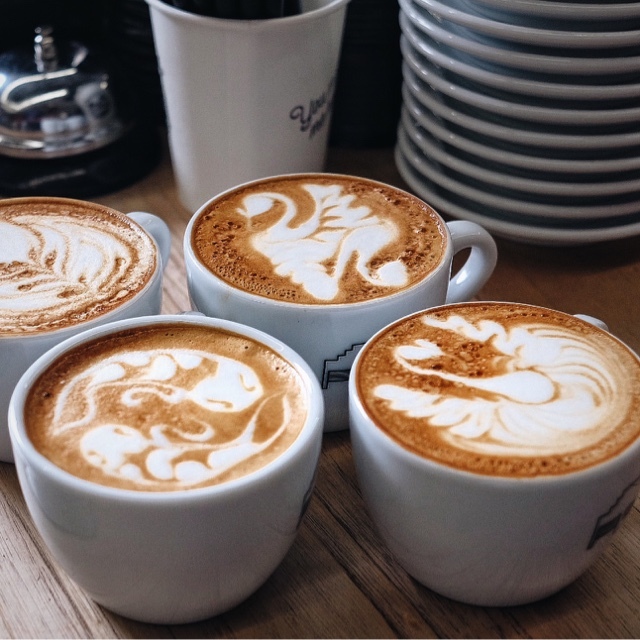 The one with koi latte art was once the winner on international latte art competition, by the one and only Ben Marrow. I liked their coffee, even though I am not an expert in coffee, I could say that theirs was enjoyable, right consistency. 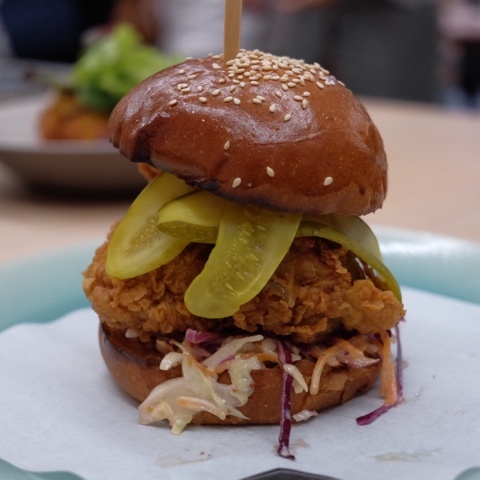 Southern kentucky buttermilk fried chicken, with fillings of house picklet, iceberg lettuce, BBQ sauce and french fries. Presentation was good, portion was generous. The bun was soft, the buttermilk was juicy and quite thick, yet tender. The other fillings added some kind of festive to my palate. Very beautiful in presentation. Crispy potato hash with mushroom, poached egg, shaved permesan, chlorophyll, and truffle vinagrette. It was my favorite among all of their menu! 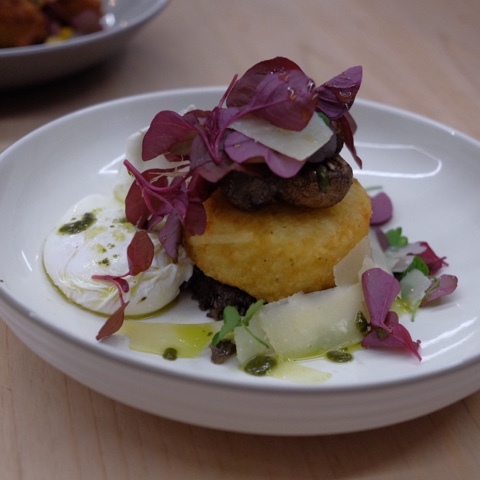 Hashbrown was crunchy and well seasoned, poached egg was perfectly fine, sauteed mushroom was tasty! Everything was tasty and contributing richness in the plate. Their secret recipe of corn fritters, poached egg, which was perfect, cucumber salsa, corn, and salad to add some freshness on the plate. 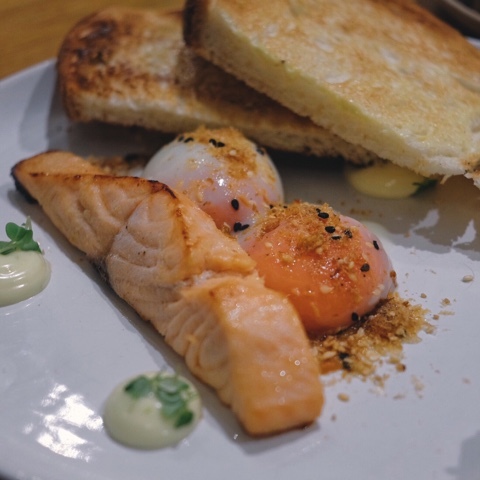 It was a classic Australian brunch menu, came it pretty way. I found it was quite generous, but still jinda pricey for a plate of it. Well, breakfast in elegance was quite expensive, right? Healthy dishes could come in pretty way, too! This omega love, consisted of smoked salmon with new season potato, red onion, green beans, tarragon dressing, and soft pouched egg. Everything was fresh and surely healthy! Well I was a big fan of brunch! And having this was easily pleasing my heart. I found the price was quite high, but they did not charge any more taxes for this. I would really come back for their goodness!